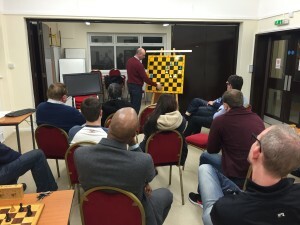 A reminder folks – we hold our next FREE theory & practice session at our club venue on Monday 23rd May, starting from 7.30pm. As usual it is open to anyone who would like to join us – we’ll have a session involving some theory, and in-depth game analysis, followed by a bit of putting it into practice. If you’d like your game to be considered for analysis, please bring it along! One of our top club players will be hosting and we’ll have our usual selection of tea, coffee and other refreshments on hand. Our previous session saw a fantastic turnout – no less than 17 people turned up including a number of new faces. It would be great to see some more new faces (and familiar ones of course!) this coming Monday – hope to see you there!! Previous Previous post: Thames Valley Div. 2 – CHAMPIONS! !